RHRLI is the only hair loss center on Long Island that offers ARTAS®, the best permanent solution for hair loss. When you visit our state-of-the-art facility in Jericho, you will understand the RHRLI edge. You’ll consult with our board-certified surgeon, Dr. Baiju Gohil, and he will lay out a treatment plan specifically for you. You’ll be able to see the cutting edge ARTAS® equipment and get to know Dr. Gohil, who will answer any questions that you may have. According to the developer’s website, ARTAS® was designed to eliminate the guesswork and fatigue that plague other hair loss procedures that use hand held devices. 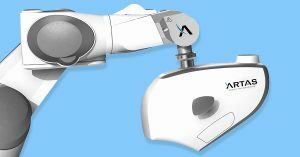 It eliminates the complications involving invasive surgical techniques that use scalpels and sutures. ARTAS® is FDA-cleared technology that will give you healthy new hair without the unsightly linear scars common to other procedures. Dr. Gohil will use the ARTAS® robotic arm to identify healthy donor hair. The hair will be harvested and transplanted to where it’s needed. The transplants are made with robotic precision and your new hair will look healthier and more natural than with any other hair restoration procedure. Every hair transferred will be just as accurate as the first one. ARTAS® hair transplants are minimally invasive. It only requires a local anesthetic and most patients report little to no pain. Some patients experience minor discomfort after the procedure which subsides in one to three days. There are no sutures or stitches so you can quickly return to your normal life. Scarring from ARTAS® is virtually undetectable. Choose any hairstyle you’d like and don’t worry about visible scars. Your transplanted hair will grow in phases, with the first new hair becoming visible in just three months. You’ll enjoy further results after 5 months and full results after a year. When you arrive at RHRLI, you’ll find a comfortable environment. We do everything to make you feel at home, including providing breaks during treatment. The most important thing that we provide you with is a permanent solution to your hair loss. You’ll have a new appearance, a new confidence, and a new outlook on life. That’s what you get from ARTAS®, with the RHRLI edge. To get started, contact us today. Previous Post: « Does the Keto Diet Cause Hair Loss?